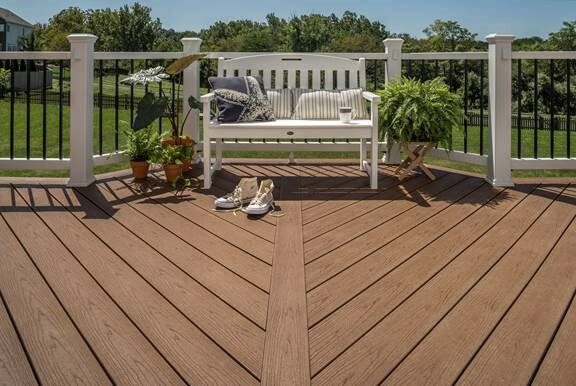 Trex announces a newly re-engineered and expanded line of Trex Enhance® composite decking. Backed by a 25-year limited residential and fade & stain warranties, the Enhance line-up is a scalloped profile that is lighter weight for easier handling and installation. Enhance Basics comes in three shades and features realistic grain patterns. Enhance Naturals introduces five multi-tonal hues that resemble the look of natural wood. The Enhance line won’t rot, warp, crack or splinter, and is easy to maintain. Spills wash off easily with just soap and water. Enhance requires no sanding, staining or painting, and its protective shell defends against severe weather and heavy foot traffic. For more information visit www.trek.com.